With the squeeze on many smaller construction sites, or when the site has access issues, one of our new 1,200 litre trailer watercarts may be an ideal solution. We understand there are times when you don’t need a full-sized watercart, so that’s why we have introduced the TWS HIRE 1,200 litre watercart trailers. 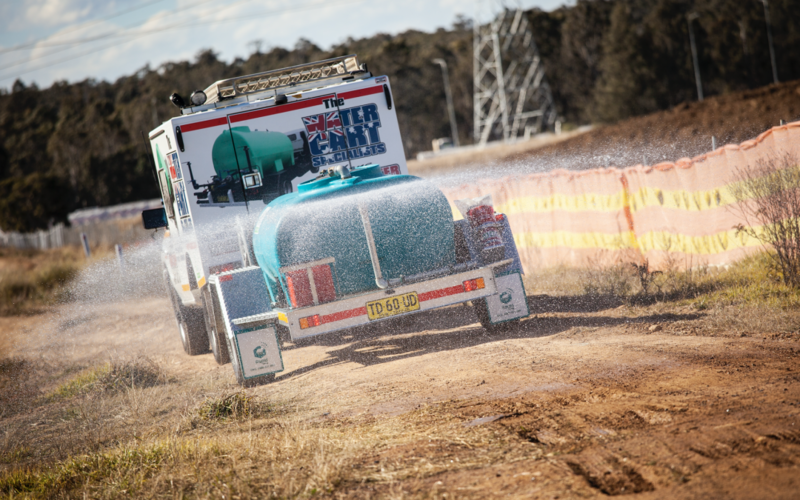 Just like our super-reliable drive yourself watercarts, the 1,200-litre watercart trailer comes fully equipped for the job. Flexible spray settings, petrol-powered Honda pumps, 35-metre hose, multiple rear sprayers/deflectors and all accessories make your water spray task so easy. And just like all our equipment, your water-trailer hire is fully insured, together with high visual yellow, red and white tape on the trailer, fully baffled tank, high pressure two-inch pump, 35 metres of hose on reel, outlet for garden hose, wheel nut indicators, fire extinguisher, 10 litres of spare fuel and two rear adjustable sprayers. If you need a watercart trailer right now, give us a call on 0448 892837 to arrange pick up from our depot at Unit 1/42, Edward Street, Riverstone.